Alumni and friends are being encouraged to “bring it home to the Hill” for Homecoming 2018 on Oct. 19-21. Martha Pirkle, Director of Alumni and Community Relations, said there will be some new activities to enjoy, as well as the traditional events. 505 Eats, Frios, Mare Sol and Your Pie will serve specialty menus, in addition to the wide variety of craft beers offered by Wild Leap Brew Co. Musicians scheduled to perform are acoustic artist Stoney Dennis ’07, 5-6 p.m.; Cougar Love, music from the 1960s-1990s, 6:30-8 p.m.; and The Reasons Why, music from the 1960s and ’70s, 8:30-11 p.m. The Reasons Why band members include Ronnie Everitt ’94, John Stewart, James Furgerson ’89, Ken Posey, Sam Thrower ’75, Russ Everitt ’74 and Greg Gregory ’73, M’76. All alumni attending will have the opportunity during the weekend to win an “Explore Downtown LaGrange Weekend for Two” giveaway. Friday’s Tom Duckett Golf Tournament celebrates the life of Tom Duckett, who graduated from the college in 1968. He was a pilot in Vietnam before being declared MIA. This annual event benefits student-athletes at the college. The Alumni Awards luncheon will be at noon Friday and will feature the presentation of the 2018 Outstanding Young Alumni Award to Dr. Benjamin Williamson ’09 and the 2018 Shackelford Alumni Achievement Awards to Bill Gambill ’67, Dr. Stephanie Gordy ’98, the Rev. Alex Harris ’02 and Layne Williams ’74. Saturday’s events will begin at 7:30 a.m. with registration for the annual 5K Run and 1-mile Walk at Price Theater. Cost is $10. The Alumni Recognition Breakfast will recognize Honorary Alumni Award winners Dr. Robert Copeland, Kirby McCartney and Dr. Brenda Thomas. Inductees into the 2018 Sports Hall of Fame will be Kristina Rosenow Johnson ’05, M’06, Michael Sims ’08 and Amanda Boley Smelsky ’05. The Class of 1968 in its 50th reunion and other reunion classes will be recognized. Alumni are invited to renew their marriage vows at 10:30 a.m. in a Christian service in the Chapel. Both members of the couple do not need to be alums. The fun will shift to the parking lot at Callaway Auditorium for the Red and Black Reunion Row, featuring tailgates with Classes 1965-76; current, retired and former administration, faculty and staff; and Greek organizations. Open houses will be held from 11 a.m. until 1 p.m. at Ida Callaway Hudson Science Lab Building, Cason J. Callaway Science building and Lamar Dodd Art Center. The Panthers will take on Maryville College at 2 p.m. in Callaway Stadium. The 2018 Homecoming King and Queen and SGA Spirit Contest winners will be announced at halftime. 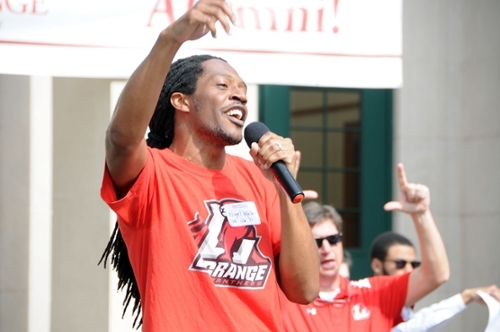 Homecoming will conclude Sunday with the traditional alumni and LaGrange College community memorial service at 11 a.m. in the Chapel, followed by the Sunday brunch buffet from 10:30 a.m. until 1 p.m. at Margaret A. Pitts Dining Hall. For a complete schedule and more information, visit the Homecoming website. 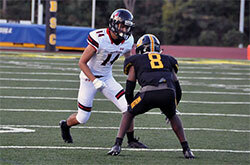 The Panthers (1-3, 0-1 USA South) lost 35-13 at North Carolina Wesleyan last Saturday. Freshman quarterback Cam Perkins ran for one touchdown and passed for another. The Panthers host Averett (Virginia) in a USA South game Saturday in Callaway Stadium at 1 p.m. 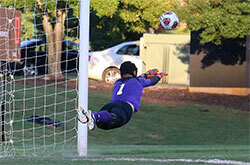 The Panthers (6-4, 2-3 USA South) beat visiting Huntingdon 3-1 in a USA South game Wednesday. Freshman Jude McEvoy had two goals and senior goalkeeper Cory Aycock had seven saves. The Panthers play at the Mississippi University for Women on Sunday in a non-conference game. 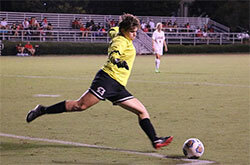 Visiting Huntingdon blanked the Panthers (3-5-1, 0-3 USA South) in a USA South game Wednesday. Freshman goalkeeper Kendall Snellgrove had eight saves for LC. The Panthers play at the Mississippi University for Women on Sunday in a non-conference game. 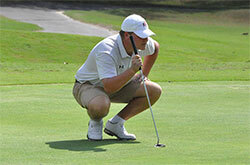 The LC golf team finished seventh at the Royal Lakes Fall Invitational in Flowery Branch, Georgia. Freshman Mathias Andersen and sophomore Sam Rogers tied for 19th in the individual standings. The Panthers play in the Golfweek Fall Invitational in Miramar, Florida, on Oct. 14-16. 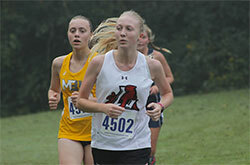 The LaGrange cross country teams ran in the Maryville College Invitational last Saturday in Maryville, Tennessee. Holly Moreland was 18th to pace the women, while Bryan Storie was 19th in the men’s race. The teams will compete in the Berry College Invitational on Oct. 13. 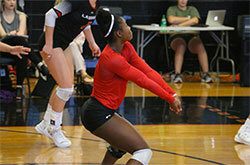 Visiting Huntingdon edged the Panthers (4-8, 2-3 USA South) 3-2 on Thursday in the Richter Gym. Jazzlyn Kenner had a match-high 17 kills for LC. The Panthers host Agnes Scott and Berea on Saturday in a USA South tri-match beginning at noon. Suber Archives at Lewis Library is holding a photo contest throughout the month of October. Take a selfie in front of a LaGrange College building and follow the instructions below to be eligible to win during the month of October. Open to faculty, students and staff. Contest rules: Take a selfie or photo in front of a LaGrange College building; post the photo to Facebook and Instagram; Tag Suber Archives and Special Collections and at least one other LC friend on Instagram, and use the hashtag #SuberAmericanArchivesMonth2018. One entry will be chosen each week during the month of October 2018 for a free coffee/drink from the Panther Café. The college will host the LaGrange PROBE Fair from 9 until 11 a.m. Monday on the library plaza. The fair is an annual college fair supported by the Georgia Education Articulation Committee that serves more than 600 high-school students from Troup and surrounding counties, and connects them with LaGrange College and over 70 other colleges and universities. Sarah Riggs Amico, candidate for Georgia lieutenant governor, will be on campus at 9:40 a.m. Wednesday in the Bailey Room to discuss her candidacy. The Campus Circle organization has entered this year’s LaGrange Has Talent competition with a video from last year’s Step Sing performance. View the 2018 contestants. For more information, view contest rules. Dr. John Tures, Professor of Political Science, presented at the Teaching and Learning Conference in Boston on Sept. 1 as part of the American Political Science Association. He was joined on a panel by professors at Harvard, Boston College and Arizona State University. The college will be closed Oct. 11 and 12 for Fall Break. Classes will resume Oct. 15.